The Technical Extended Range Diver course completes your training as an entry-level tec diver, taking you past the limits of recreational diving. After successful completion of the Technical Extended Range Diver course you’ll be able to independently conduct actual gas switch, decompression dives using air, enriched air and oxygen to a depth of 50m/165 feet. You’ll use decompression software to create custom dive tables and plan your dives. You’ll also understand the hazards and risks involved in technical diving, as well as how to prepare for and handle reasonably foreseeable technical diving emergencies. 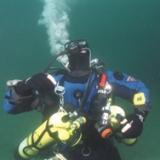 Have a minimum of 70 logged dives, including at least 20 dives deeper than 100 feet, and at least ten (10) dives requiring staged decompression with at least one (1) gas switch. Double cylinders with dual manifold and 2 decompression cylinders (will be supplied). Two primary regulators and two secondary, deco regulators – One (1) primary regulator must have seven foot / two-meter hose for air sharing. Deco regulators must be O2 serviced.